Winfried Vahland (middle), president and CEO of VGC, together with Liu Jian (left), general manager of Shanghai Volkswagen and An Tiecheng (right), general manager of FAW-Volkswagen, release the company's new strategy with a long-term perspective to the Chinese market recently in Beijing. Volkswagen AG is best known as the manufacturer of the iconic "Beetle", but its new claim to fame may be its recession-busting bid to boost production and increase market share in the already highly competitive Chinese automotive market. The German company has just unveiled ambitious plans to consolidate its position in China through both new marketing initiatives and a product development program tailored to the needs of the Chinese motorist. The bold manifesto, released on Feb 26 with target of increasing annual vehicles sales from the current 1 million to 2 million as well enlarging its fleet by adding or renewing at least four models per year by 2018, will open a new chapter for the company's operations in China. "We have launched Strategy 2018 in line with the long-term objectives of the Volkswagen Group in China. It follows on from the successful restructuring, in line with the Olympic Program, we adopted in the run-up to the 2008 Games," said Winfried Vahland, executive vice-president of the Volkswagen Group, and president and CEO of Volkswagen Group China (VGC). 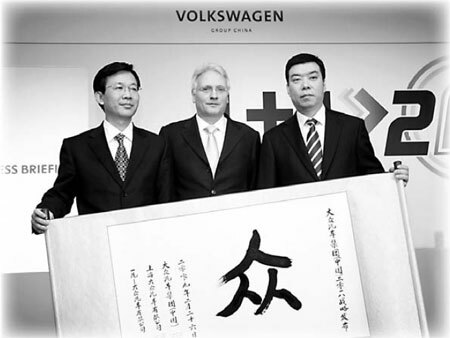 According to Vahland, 2008 was an extraordinary year for the company and its two Chinese joint venture companies, Shanghai Volkswagen and FAW-Volkswagen: "We exceeded our three-year Olympic Program (2005-08) targets and achieved every objective identified in our 'Year of Striving for the Gold Medal' initiative. We also sold more than one million cars for the first time. These remarkable achievements have consolidated Volkswagen's dominant position in the Chinese auto market and have laid a solid foundation for VGC's continued growth." As a result of the recession in the global economy , many auto manufacturers encountered an unexpected sales reduction last year and are now planning production and sales cutbacks to live through tough times in 2009. Some of them are even considering of shedding off unprofitable brands and assets. "Although the global economy and automobile markets still face challenges, we remain fully confident in the long-term prosperity of China's automotive industry and of Volkswagen Group's future role as an industry leader in the country," said Vahland. Vahland believes that Shanghai Volkswagen and FAW-Volkswagen, two powerful joint venture companies, can generate new win-win partnerships and achieve even greater success for VGC in the future, a concept VGC refers to as the "1+1\>2" Philosophy (one plus one is greater than two). "We recognize that the slowdown presents challenges. We have defined the plan to face these challenges and take advantage of all the opportunities on offer." His confidence comes from the excellent sales performance Volkswagen Group achieved last year. For the 2008 fiscal year, with a 4.5 percent increase in sales revenue to 113.8 billion euros, the Group's operating profit rose by 3.0 percent to 6.3 billion euros. "We met our target and surpassed our record results for 2007, even though conditions were tougher," Chairman of the Board of Management of Volkswagen AG, Martin Winterkorn, said yesterday. "The current year remains extremely difficult for the entire automotive industry. Our target is to perform better than the overall market," Winterkorn commented on future business. Last year, the company, the biggest European carmaker, released Mach 18 (Group Strategy 2018), a development plan for the Volkswagen brand globally that established the development direction of Volkswagen, with the ultimate goal of becoming a leader in the automobile industry worldwide. In November, it pushed forward a plus plan with focus on becoming an economic and environmental leader in the global automotive industry, which remains the central element of the Group Strategy 2018. For this reason, the Volkswagen AG Board of Management is intensifying efforts to continue with the successful realization of this ambitious project even in a difficult economic period. Based on Mach 18, "VGC's newly-launched Strategy 2018 is geared toward the current ongoing Chinese automobile market situation and is related to all brands and long-term business strategy in China in order to achieve the sustainable development of the company," said Vahland. "And we want to deliver a very clear message (by the strategy) that we at Volkswagen promise long-term development in China and will increase our investment in this market." Last year, Volkswagen sold 1.02 million vehicles in China - marking a year-on-year growth rate of 12.5 percent. This easily outstripped the 6.7 percent average increase for the whole industry - the smallest increase in a decade on account of growing concerns about the international financial situation. Total vehicle sales for 2008 were said to be around 9.4 million. Sales of the Volkswagen brand amounted to 844,491, up 8.2 percent from 780,784 units in 2007, including 12,649 imported vehicles. Audi delivered 119,598 vehicles to customers including 13,640 imported units, with a 17.3 percent jump. The sales of Skoda cars more than doubled to 59,284 from 27,325 units in 2007. The group also sold 518 Bentley cars, and 117 Lamborghini super sports cars in 2008. To achieve its double-sales target by 2018, Volkswagen is aiming to improve customer satisfaction and brand image through enhanced dealer networks and an upgraded service. It will double dealership numbers from 1,000 to 2,000. This expansion will coincide with improvements in dealership management aimed at creating the best customer service ethos in the Chinese automotive market. Volkswagen was one of the first overseas car manufacturers to venture into the Chinese market with a focus on developing a dedicated dealership network. During the past 25 years, VGC has seen its dealership sales grow from initial sales of 1,710 units in 1985 to current sales of more than 1 million cars per annum. Vahland also outlined his belief that the bulk of market growth will come from increased demand for passenger cars, especially in medium and small cities, where the presence of VGC is currently relatively weak. However, he also said the ambitious expansion plan never meant compromising on quality. The company's commitment to green issues was also paramount in its future plans in China. "We will continually optimize production in terms of production efficiency and product quality in order to maintain our leading position in the industry," said Vahland. The company also maintains a commitment to two of the company's existing initiatives - its "Powertrain" technology/customer service strategy and a wider policy of developing more environmentally-friendly cars. VGC remains committed to a 20 percent reduction in fleet consumption and emissions by 2010. The implementation of the Powertrain technology, Volkswagen's proprietary environmentally-friendly technology brand, has already made remarkable inroads in achieving these objectives. "So far, we have reduced the average fuel consumption of our automotive marques by 15 percent. Engine downsizing strategy is another sector we are focusing on. We are looking at not only reducing fuel consumption, but also at generating more power," said Vahland. VGC also has underscored its commitment to the environment through a series of highly successful initiatives throughout China. As well as the introduction of its Powertrain technology, it has sponsored a TV series on road safety, produced a green education campaign (entitled "Volkswagen's Green Future Environmental Protection Initiatives"), and launched both the Shanghai Volkswagen's Olympic Wish Woods Plan and the FAW-Volkswagen's Public Welfare Woods program. It also provided a "Green Fleet" to assist with the logistics of the 2008 Olympics.